Surprise! I have given my blog a new lease of life by making it a little fresher, with bigger food photographs – to tempt you into making my recipes of course. How do you like it? I’ll probably tweek it here and there as it is not exactly how I want it but it will do for the mean time. It’s also probably at it’s best looked at on a computer as opposed to a mobile or iPad but any device will do. Leave a comment below once you have had a little look around. Now back to the important stuff…. the recipe. This week I want to tempt you into making this wonderful dish that can be eaten hot or at room temperature, perhaps for a picnic. It requires a little effort in as far as locating the wonderful fregula, but once you have done that making the recipe is a doddle. So what on earth is fregula I hear you all ask? Well in a nutshell it’s a Sardinian pasta, which is similar to couscous in appearance, and comes in a variety of sizes. It’s made from rubbing semolina and water to create a crumbly texture that is then rolled into balls. It is then sun dried and toasted briefly in the oven. This process allows the fregula to have that ‘al dente’ texture giving it a slightly nutty taste. I am not suggesting you make the fregula from scratch, far from it. You’ll find it most Italian delicatessen and I wouldn’t be surprised if some of the larger supermarkets may well stock it. If they don’t then I am sure they will very soon. The overall dish is healthy, takes under quarter of an hour to prep and cook and is really delicious. 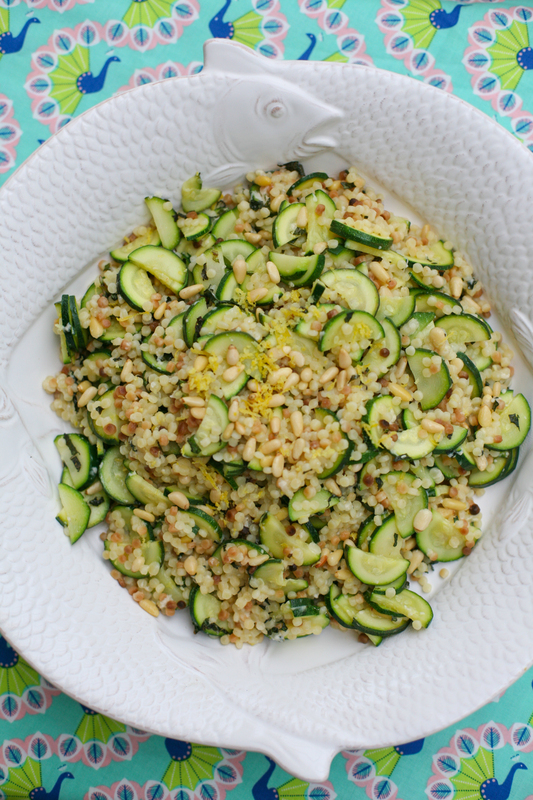 The flavours are fresh and cleansing, coming from the mint and lemon and this combined with nutty fregula and pine nuts, umami parmesan (check out my article on umami here) and the bright green courgette. It’s a winning recipe if you are entertaining and want no fuss with cooking as it can all be prepped before guests arrive, aside from the boiling of the fregula and courgettes. For those who like shell fish I will be doing another fregula recipe again in the next few weeks – that leaves you more than enough time to hunt down a packet from your local Italian deli. 1. Place the fregula in boiling water so that it is completely covered for 12 minutes. 2. Prepare all the other ingredients, whilst you wait for the fregula to cook. After 12 minutes add the half moon courgettes, adding more boiling water if necessary, and cook for 2 more minutes. 3. Drain the courgettes and fregole and place in a large mixing bowl. 4. 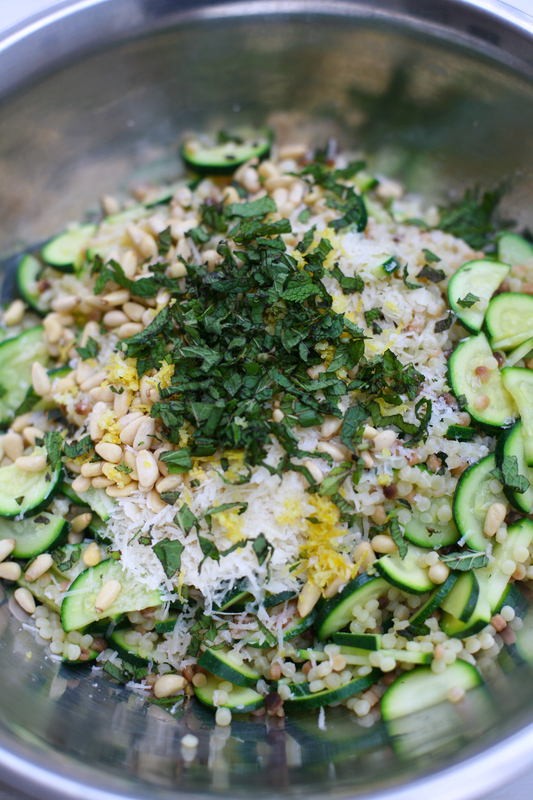 Add half the lemon juice and zest, most of the parmesan, the mint leaves, pine nuts and season with salt and pepper. Taste and add more lemon juice and zest to taste. 5. Serve in one large bowl/platter and allow everyone to serve themselves. Sprinkle with the remaining parmesan. This entry was posted in Vegetable, Vegetarian and tagged easy, quick, salad, spring, summer, vegetables, vegetarian. Bookmark the permalink. Well now I haveto find fregula!!! Lovely photos! Great post! What a fabulous recipe and love your new look. Yes, your photographs make me want to try your recipe for sure! I noticed the change right away – so fresh! And I LOVE, screen-filling big pix (I have them too). And speaking of filling, this gorgeously savoury and herby fregola sounds and looks fabulous. Sharing widely! Ps: thanks for sharing widely. 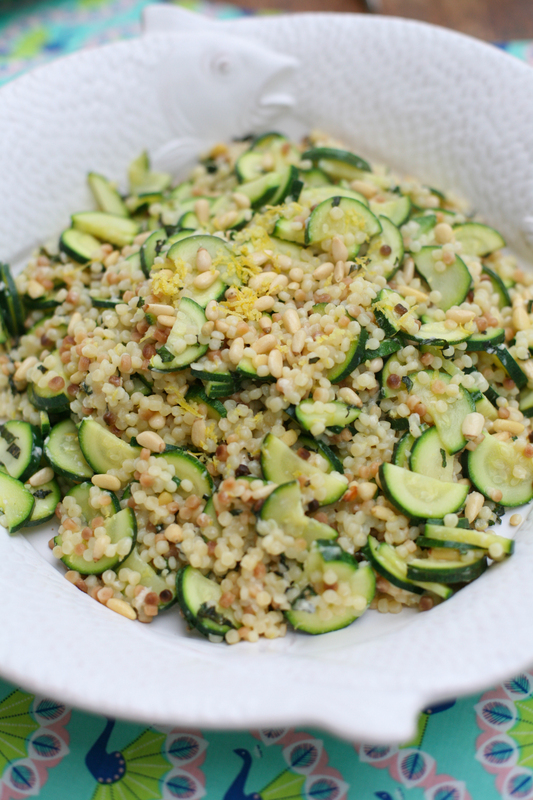 Wonderful summer flavored dish, I´ll keep my eyes open to spot the fregula round here in the South of Germany- meanwhile good old couscous will have to do the job… As of your look:I love large pictures as well, on condition of them being as beautiful as yours! Your blog looks cool, very food focused, without visual distractions from too many widgets , side bars etc. , love that! that looks so delicious and refreshing! 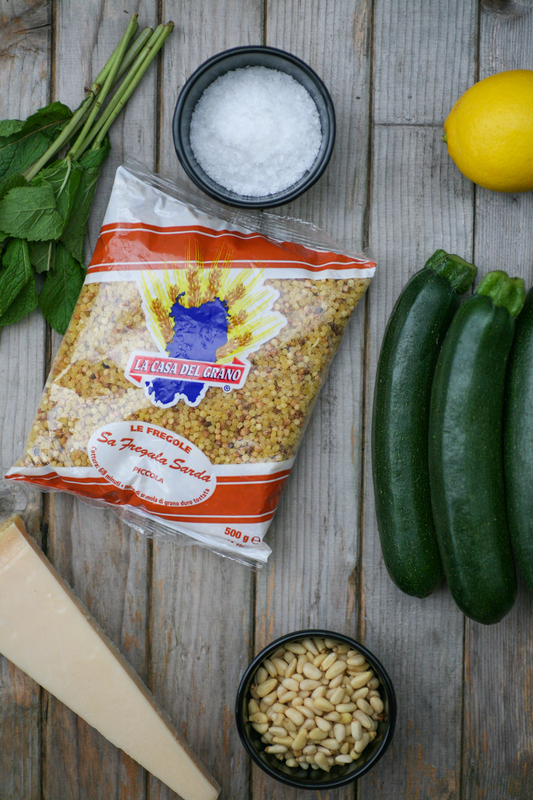 love the idea of using fregola! Could this be eaten cold as a salad dish? Absolutely Christine it would work equally well and perhaps even better at room temperature.